Have a Process... And Stick to It! Coach Brent teaches kickers, punters & snappers about the importance of following a process to improve their confidence & maximize performance under pressure. At our camps we always talk about following a process and the importance of not skipping any steps of it. This weekend, one of our campers cited his job as a good example of a process… he works at a pizza place and they have a system in place where one person rolls the dough, the next puts the sauce on, and another puts the toppings on and puts the pizza in the oven. Someone else cuts it and then boxes it. We talked about how if one part of this process was skipped (i.e. someone forgot to cut the pizza before sending it off), then the entire end result is ruined. Baking and preparing a pizza is no different than you lining up your field goals or preparing to receive and send off a punt or taking your stance to fire back a perfect spiral punt. You must follow the process and repeat it the same exact way every time in order to achieve consistent results. Well what if you don’t have a process? That’s what I’m going to help you with right now! While he’s certainly had his issues and is no longer playing at the level he once was, Tiger Woods is a terrific example of someone having a routine (think pre-kick routine), or a process. Check out this video in which he goes over his process of preparing for and lining up a putt. 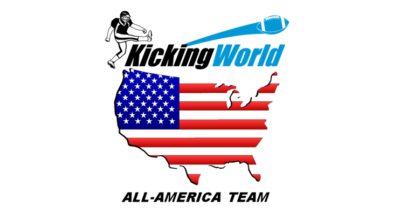 While this is not a kicking video, it is very relevant to you as a kicker, punter or snapper. Nod to your holder when ready and confidently put the ball through the uprights! WHY is a pre-kick routine or process essential to achieving consistent long term results? I’ve been reading a lot of books on sports psychology lately, particularly to help my golf game (lol) and it got me thinking. I always had a process when kicking in HS and college and we always teach this process mentioned above to all our students, but WHY do we actually do it? As I learned in this fantastic book titled Golf is Not a Game of Perfect by Dr. Bob Rotella, having a routine to follow allows you to control your emotions and body and helps you become much less distracted by outside influences (noise, wind, pressure, nerves, negativity, loss of confidence, etc). Following this process daily will eventually enable you to reach your ‘unconscious’ performance state. Some people call this playing out of your mind. Basically, you are past the point of overanalyzing each technical/fundamental aspect of the kick and you trust your process and put the ball through the uprights; it’s that easy. Lots of beginner kickers at camp have a difficult time (immediately) implementing their new-found instruction, which is completely normal. It takes time to practice something new, but after you create and follow that process, and automate it, everything starts to click! Dr. Rotella talks about having a golfer focus on where he wants to aim the ball, and taking his 1 or 2 practice swings, and then just setting up with laser focus to hit the ball to the target. His philosophy is that if your mind is solely fixed on where you are wanting to hit the ball, that you forget all of the nuances of the golf swing and simply trust your body will do what it knows how to do. This is the same for kicking… I feel if you put the emphasis on your alignment/target and make sure to breath and focus during your setup, then your mind is less likely to start wandering and thinking ‘I need to remember to get my plant foot to the right spot or I need to start my downswing with my foot, not my knee or o shoot, I missed my first PAT this game, if I miss this one, the coach is going to pull me)! All of those thoughts occur because of DOUBT. The easiest way to resolve doubt is to establish a process, practice it several times a day and come game time it should be automatic. This week during practice, I want you to write down your process and practice it at least 20x a day before you kick a single ball. You can even practice it on non-kicking days inside your house! If you can do this 100x a week for 5 weeks in a row, I’m confident you will see a noticeable improvement in not only your confidence, but your end result with more repeatable results, and better looking kicks, punts and snaps. Check out Golf is Not a Game of Perfect (Dr. Bob Rotella) to help your golf (and kicking) game as well as my Complete Guide to Kicking & Punting book.